Barbara Banke and Bob and Kristine Edwards' Good Magic hadn't yet broken his maiden, but the Chad Brown trainee proved a dominant winner of Saturday's Breeders' Cup Juvenile at Del Mar when he crossed the wire 4 1/4 lengths in front of his nearest rival. The juvenile son of Curlin and Jose Oritz had excellent stalking position in fourth through the early going, then grabbed the lead in the far turn and continued to draw away down the lane. Solomini, also by Curlin, ran on well for second, while 3-5 favorite Bolt d'Oro finished third. Good Magic covered 1 1/16 miles over the fast main track in 1:43.34, making history as the first maiden to win the Juvenile and paying $25.00 to win. It was the second-ever Breeders' Cup win for Jose Ortiz, and the tenth overall for Chad Brown (though it was just his second win on the dirt). The Edwards family also won the Breeders' Cup Juvenile Fillies Turf on Friday with Rushing Fall. U S Navy Flag took the lead out of the gate and got immediate pressure from Solomini, blazing through a first quarter in :22.83. The Tabulator was just in front of Good Magic, with Hazit racing up close as well. Undefeated favorite Bolt d'Oro left the gate from post 11, and was hung extremely wide around the first turn, at least five paths off the rail early and three-wide heading into the backstretch. As Solomini kept up the pressure on U S Navy Flag through a half in :46.75, Corey Nakatani tried to move Bolt d'Oro into contention down the center of the racetrack. Good Magic had a golden spot slightly off the rail in a joint third with The Tabulator, waiting patiently under Ortiz. Taking the lead at the head of the lane, Solomini was quite a ways off the rail. The Tabulator tried to make a run at him, but was getting out around the turn. That made room for Good Magic to make his move just as U S Navy Flag was dropping back. Good Magic ran down Solomini in early stretch and was drawing away late, crossing the wire 4 1/4 lengths in front. Bolt d'Oro made a strong move around the far turn but was hung wide once again; he flattened out late in the stretch to finish third. Givemeaminit finsihed fourth. Bred in Kentucky by Banke's Stonestreet Stable, Good Magic was a $1 million yearling at the Keeneland September sale. Purchased by the Edwards' e Five Racing Thoroughbreds, which also comprises the couple's three children, Good Magic proved to have some talent so Banke joined in as a partner. The colt had twice finished second, most recently in the G1 Champagne Stakes, but the Juvenile was his first career win. Overall, Good Magic has earned $1,216,600. 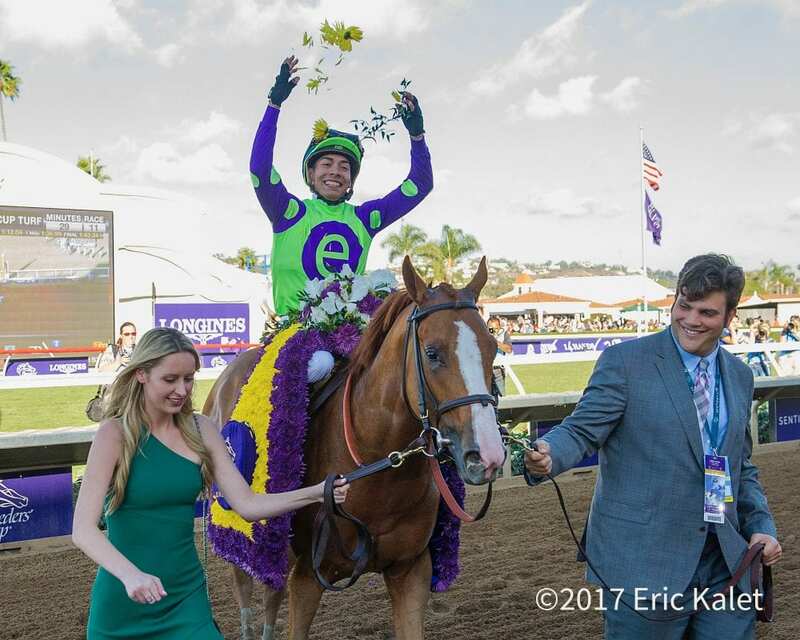 This entry was posted in Breeders' Cup, NL Article, Videos and tagged bolt d'oro, Breeders' Cup, breeders' cup juvenile, Chad Brown, Curlin, Del Mar, del mar thoroughbred club, good magic, jose ortiz, mick ruis by Paulick Report Staff. Bookmark the permalink.